Conserve water in the garden with the installation of a time-saving drip irrigation system. Tired of standing next to your planting beds, garden hose in hand? Concerned about getting too much water where you don’t need it and not enough where you do? The solution is simple: install drip irrigation. Drip irrigation delivers water slowly and steadily to plant roots. It’s a system that, while discouraging the spread of weeds, prevents many of the problems that commonly result from overwatering, including soil erosion and puddling, plant disease and fungus growth. You also save water; compared to conventional watering, drip irrigation uses 30% to 50% less. Best of all, drip irrigation means you can stop worrying about remembering to water. Set up your system with an automatic timer, then go out and enjoy your summer! If you wish to install drip irrigation, the first step is to plan out the placement of drip lines. Measure how much tubing you will need, for the main header hose as well as for the tubes that will run to the plants. 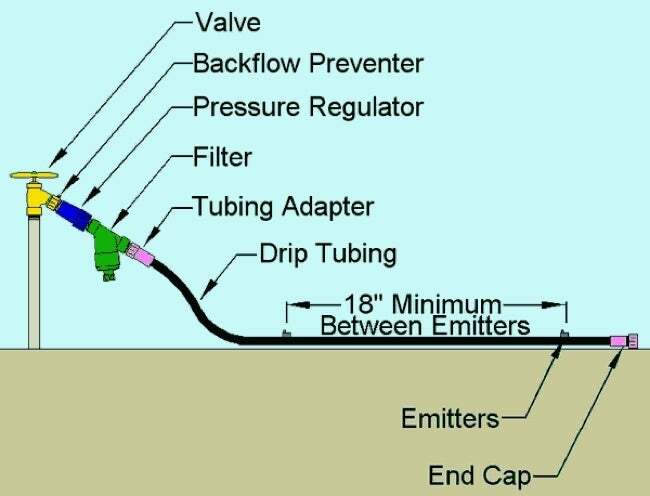 In addition to tubing, you must also account for the number of emitters and end caps required to achieve your site plan. Depending on what types of plants you have and their respective watering preferences, it may be wise to use different shut-off valves for different sections of your garden. Most of the components needed to install a drip irrigation system are readily available. There are also many different kits you can purchase. A basic one typically starts at about $35 and will cover from 25 to 100 linear feet. More elaborate and larger kits can cost up to $300, but given the many benefits of drip irrigation, that seems like a small price to pay.